Dental implants are a permanent solution to missing teeth for adults of any age. A single tooth, several teeth or a whole set can be replaced. Dental implants provide the best long-term solution however you have lost your teeth. They look, feel and function like your teeth, allowing you to eat, speak and smile with confidence. Jonny Lynd has a special interest in dental implants and has been attending courses since 2009 and placing implants since 2010. He is a member of the International Team for Implantology (ITI) and the Association of Dental Implantologists (ADI). If you have dentures, dental implants can be used to support and add retention. A dental implant is a small titanium screw that is used to replace the root of a missing tooth. 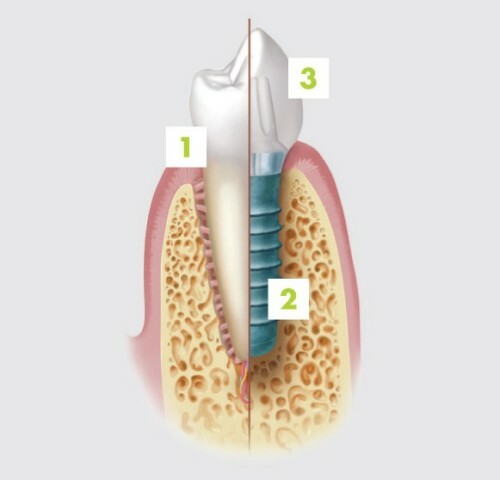 The implant is carefully placed in the bone and given time to integrate within the bone. During this period a temporary tooth is provided so you can continue in your normal daily life. Once the implant has integrated a tooth is fitted to the top of the implant and acts as a replacement for your missing tooth. At Pure Dental Centre we place only Straumann dental implants. Straumann is one of the global leaders in the manufacturing of dental implants with over 4 million implants placed in the last 30 years. The implant itself has a lifetime warranty against mechanical failure.